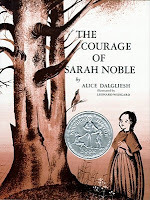 The Courage of Sarah Noble is a short chapter book set in 1707, which is suitable for second and third graders. It tells the story of a real child who accompanies her father into the wilderness to cook his meals while he builds their family a new home. Sarah is nervous, but reminds herself of her mother's advice to hold on to her courage. When Sarah's father goes back to bring the rest of the family to the new house, Sarah must stay behind with Tall John, an Indian who lives nearby, and his family. Since she does not speak their language or understand many of their customs, she once again finds herself feeling uncertain and needing to summon her courage. For the time period in which it was written and the age group whom it targets, this book is a decent introduction into life in the early American wilderness. Though some characters express stereotypical fears and concerns about the native people living near them, these are put down by Sarah's father and shown to be foolish and insensitive things to say. 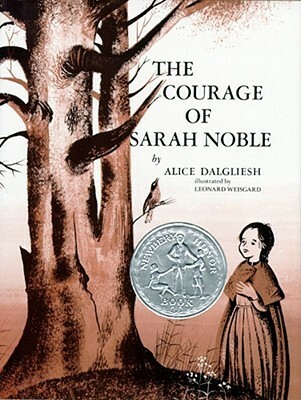 Perhaps Sarah and her father are a little too kind and a little too enlightened to be realistic, but this is a chapter book for beginning readers, and the sunny outlook is certainly age appropriate. There are reviews all over Goodreads condemning this book as racist for all sorts of reasons, many of which contradict each other. Instead of finding a way to be offended, as is the popular thing to do these days, I'd rather look at the book as a product of its time and use it in the way I believe it was intended - to introduce concepts of tolerance and kindness to young kids for whom this age-old subject matter is brand-new territory.